According to a CBS News/New York Times poll, Americans support the idea of using military force to remove Saddam Hussein. But they overwhelmingly want diplomatic efforts and the inspections to run their course first -- they would want to see clear evidence against Iraq before going to war. If the inspectors haven't found any weapons by next Tuesday -- a deadline for U.N. weapons inspectors to report their findings -- Americans say give them more time. Most Americans think those weapons are there to be found, though many doubt inspectors will find them. The poll found 63% of Americans want President Bush to find a diplomatic solution. It also found support for military action -- if it becomes necessary -- is still high, but it has slipped from just two months ago -- 64% now compared to 70% last November. What's more, Americans seem to want hard evidence that Iraq is cheating. More than two-thirds (77% to 17%) say if inspectors haven't found a smoking gun, they should keep looking. For the moment, diplomacy is the clearly favored course with regard to Iraq, a feeling that hasn't changed from two weeks ago. WHAT SHOULD THE U.S. DO NOW WITH IRAQ? When the U.N. weapons inspectors present their report on January 27th, if they say they have not found any weapons of mass destruction, Americans strongly believe they should take more time to look. And even when this question is framed to put the burden of proof on Iraq - asking what the U.S. should do if Iraq cannot show proof that its weapons program has been shut down - Americans are equivocal about military action: half support a strike and half say the U.N. should still take more time. Americans overwhelmingly believe Hussein does have weapons of mass destruction: 85% say so, even though the inspectors haven't uncovered those weapons yet. Of those who think Iraq has weapons stashed somewhere, about half are pessimistic that they'll ever turn up. Either way, war seems inevitable to most Americans, a feeling that has not changed since the fall. 72% say the U.S. will end up fighting Iraq. In November 2002, 69% believed this, and in September 74% did. General support for military action -- when and if it comes -- is still strong, but it has dipped of late, and the number who disapprove is the highest it has been in a year, jumping up to one-third of Americans. 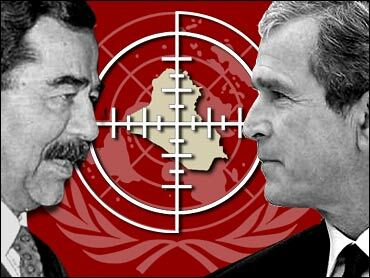 SUPPORT TAKING MILITARY ACTION TO REMOVE SADDAM HUSSEIN? Disapproval of military action is very high among America's World War II generation - those over 65. Less than half of them approve, while around two-thirds in every other age group do. Similarly, an overwhelming 87% of those 65-plus want a diplomatic solution instead of military action now. All other age groups also favor diplomacy now, but by smaller percentages. Americans are increasingly concerned that their country is losing respect around the world. A majority, 55%, believes that the U.S. is now less respected in the world than it was two years ago and only 12% say the U.S. has gained respect of late. Just three months ago, 19% said the U.S. was more respected. U.S. GAINING OR LOSING RESPECT IN THE WORLD? Meanwhile, with ongoing debate between the U.S. and its allies about the timetable for Iraq, Americans don't see the country's relations with its European allies improving, either, though most say relations are about the same as they were two years ago. Only 14% say relations with European allies are better than they were two years ago. And Americans are leery of the possible consequences of a U.S. strike on the odds of another terrorist attack. 62% are fearful that war with Iraq will increase – not decrease – the threat of terrorism against the U.S.
Just over one-third of Americans think the Bush Administration has tried hard enough to reach diplomatic solutions with Iraq, but 55% say it has been too quick to push for the use of military force. Americans see this tendency in the Administration's overall foreign policy, as well, with a majority thinking it is too quick to consider military actions. The Bush Administration: Too Quick To Use The Military Vs. Iraq? Overall, nearly half of Americans, 46%, believe that President Bush's policies are making the U.S. safer from terrorism, which is more than double the 17% who say those policies are making the country less safe. But 34% say his foreign policy is making no difference in that regard. IS BUSH'S FOREIGN POLICY MAKING THE U.S. SAFER FROM TERROR? Many people think the Administration isn't so much following a policy as it is reacting to events. 55% believe it is reacting to foreign events as they occur, while 40% believe the Bush Administration has a clear plan for its foreign policy. Similarly, in the campaign against terrorism, just over half -- 53% -- think the Administration is reacting to events as they occur, and 43% say it appears to have a clear plan. As new reports surfaced about how Osama bin Laden may have escaped U.S. capture last year, respondents were asked how much progress the Bush Administration had made in eliminating the threat of terrorists operating from Afghanistan and other countries. The vast majority of Americans believe it has made at least some progress, though only a few (15%) say it has made a lot. The threat from Al Qaeda is still on the minds of many and is still seen to outweigh the threat from Iraq. Asked whether Iraq, North Korea or Al Qaeda represents the greater threat to peace and stability, 46% said Al Qaeda, more than double the 22% who said Iraq, while 16% pointed to North Korea. And a majority of Americans thinks that the Bush Administration has not made much progress in improving the image of the United States in the Arab world. 35% say the Administration has made at least some progress in this regard, 60% say it has made not much or none. This poll was conducted among a nationwide random sample of 997 adults, interviewed by telephone January 19-22, 2003. The error due to sampling for results based on the entire sample could be plus or minus three percentage points. Sampling error for subgroups may be higher.